Assistant manager Steve Walford says Bolton Wanderers boss Neil Lennon has the support of staff and players after discussing allegations made about him by a newspaper with the group. 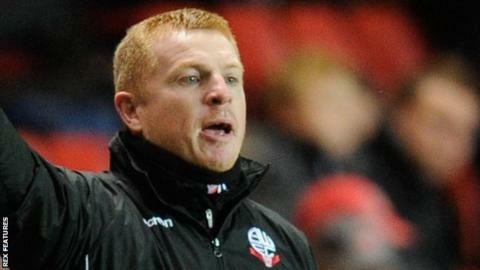 Bolton confirmed Lennon would keep his job after an internal investigation. The Sunday Mirror alleged the 44-year-old made a threat to a woman it claims he was romantically involved with. "He's obviously down and very sorry for his actions," Walford, 57, told BBC Radio Manchester. "I've known Neil a long time and he'll bounce back, no danger. The players and the club are all behind him now. "As far as I'm concerned, I think the matter's closed." Lennon will lead the team for Boxing Day's Championship fixture at Rotherham United. It has been a tough season for Bolton on and off the field, dropping to the bottom of the league without a win in 16 games and financial problems threatening the existence of the club. The Trotters are £172.9m in debt and received a winding-up petition for about £600,000 in unpaid taxes. Takeover talks have been held with four parties, but unless a deal is done, they face administration and a 12-point deduction. Bolton's players were not paid in November, but it was confirmed they would get their wages by 29 December with help from the Professional Footballers' Association. "The players have been brilliant regards not being paid," Walford added. "Their attitude has been superb, they've got on with it, trained and played as if nothing has happened."